The Canadian hot shoe gets back to his winning ways in Montreal. Exclusive Autosport returned to the Montreal F1 Grand Prix for the Formula Tour 1600 Championship on June 9-11 with a statement, sweeping the double-header event courtesy of an outstanding performance from Alberta’s Parker Thompson. 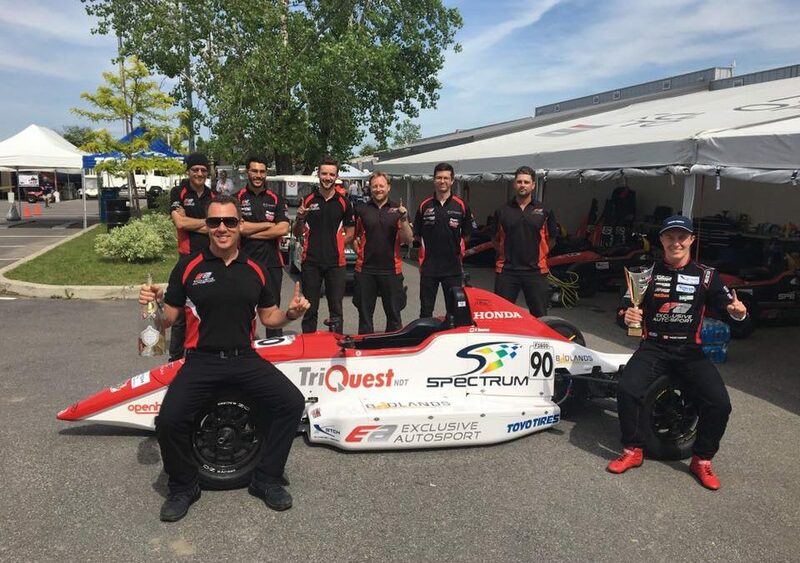 The 19-year-old Canadian piloted the special 50 years of Formula One in Canada livery #90 Triquest NDT car to double Victory in Canada largest F1600 event of the year. Thompson, a regular in the USF2000 Championship in the United States, quickly dialed himself in at the Circuit Gilles Villeneuve track working well with the team’s lead engineer, Christophe Boisclair. Parker’s pace was on the money right away as he qualified second for race one at the Grand Prix, without a drafting partner at the high-speed circuit in Quebec. His performance in Race 1 made the most of that pace as he took command of the 30 minute event, leading every lap even with two full restarts due to cautions. He doubled up his results for the second race, again starting second on the grid at the famed circuit. Race 2 played out the same as the first had for the hard charging teenager. From the first corner to the last, Thompson took charge and managed to lead every lap. The race came down to the wire though, with a one lap restart to finish off the race Thompson managed victory only by 0.010 of a second. It was labelled as one of the most exciting races the Grand Prix of Canada had to offer in its 2017 edition. “It couldn’t really have gone any better for me this weekend,” stated an enthusiastic Thompson. “The team gave me an awesome on such short notice, so to get them the wins they deserved felt amazing. The hard work paid off for the entire crew, and I couldn’t be prouder to work with such like-minded individuals. We all want nothing more than to win, second is not an option. Also, I would like to extend a huge thank you to my partners for the weekend, TriQuest NDT and Badlands Motorsports Resort. Without them I never would have had the opportunity to etch my name into history as the 50th Anniversary 2x winner of the Grand Prix of Canada. After such a successful event together at the Montreal Grand Prix, Thompson and Exclusive Autosport will attempt to compete in the full Toyo Tires F1600 Super Series Championship, with a lack of budget holding the campaign back. The potent duo are currently at the Canadian Tire Motorsports Park to compete at round two of the championship this weekend. Thompson will be piloting the #93 Badlands Motorsports Resort car this weekend in Ontario, looking for victories in the triple header event. Stay connected and follow along with Thompson and the Exclusive Autosport crew through their social media updates all weekend long.